Sometimes just the length of a blog post can convey how complicated a concept it’s trying to convey. Long blog post – it’s probably a complex idea. A short blog post on the other hand is likely to convey a simple idea because it just doesn’t need much of an explanation. It’s so simple and intuitive that even writing it is a borderline insult to the reader’s intelligence. Why the dissertation on blog post length? Frankly a blog post on the types of wines to pair with a big, fatty piece of red meat or lean, juicy cuts (like this one for instance) is so obvious, it’s almost embarrassingly short but this is probably the simplest wine and food pairing there is so a detailed explanation isn’t needed. 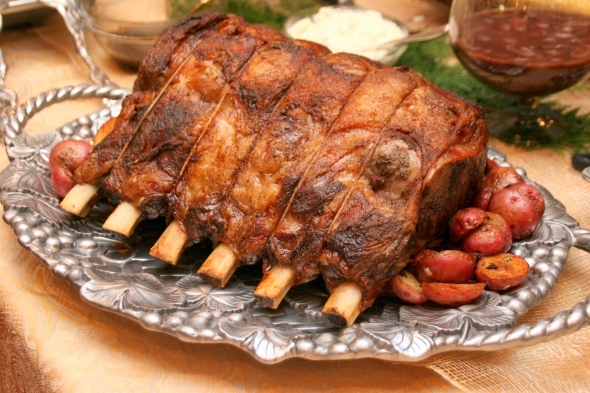 To many people, Prime Rib and Standing Rib Roast (in Prime Rib’s roast form) are the ultimate cut of meat. Thick, usually served rare and with about as beefy a flavor as beef can get. This is not a delicate five ounce portion of meat usually associated with Filet Mignon. These are usually gut busting, club wielding, caveman sized portions. Do you want something the looks like the entire side of a Woolly Mammoth was just plopped on your plate? If so, then this is your cut. Standing Rib Roast and Prime Rib have a considerable amount of fat and it’s that fat that helps give it the strong beef flavor and much of its tenderness. That fat also precludes any kind of white wine pairing. Leave them in the wine closet, cellar or just don’t bring them home from the store for this meal. Not only will they be overwhelmed by the strong beef flavor of the prime rib but they also won’t do anything to enhance the flavor of the meat. What’s that you say? The wine is supposed to compliment the meat, not the other way around. Well, that’s often the case with lighter meats and wine but a curious synergy happens when strongly flavored, fattier red meats meet heavy red wines, particularly those with strong tannins. Eat a large cut of prime rib with a mild red wine or a white wine and eventually the fat will coat your mouth and you actually taste less of the meat. This is the time to introduce that big tannic Cabernet and not only does the tannin in the wine compliment the strong flavor in the beef but it also acts as a solvent, dissolving much of the fat from the taste buds on your tongue, allowing you to continue to enjoy that monstrous slab of meat all the way to the end of the meal. If you’re looking for red wines with high levels of tannins, the most common are Cabernet Sauvignon and Petite Sirah. If you want to try something a little less common, look for a Petite Verdot which is usually used as a blending grape with Cab Sav or other Bordeaux varietals. Nebbiolo is a great Italian red wine that makes up most of the famous Barolos from Piedmont. It has wonderful tannin and is a great compliment to prime rib. Another great wine would be a Touriga Nacional from Portugal. Most Touriga is used in Ports but when made as a Varietal, it’s a fantastic, deep, rich wine with abundant tannin that pairs perfectly with prime rib. If Prime Rib, is the big old pickup truck of meat, the Filet Mignon is the Italian sports car, sleek, refined and pretty pricey for what you get. When properly prepared, a Filet Mignon is tender and flavorful but it will never beat your taste buds into a pulp and a wine to accompany it should have the same qualities. I believe that the suggestions for pairing wine and Filet Mignon pairings might the most egregiously incorrect in Western cuisine. Most advice columns suggest that a bigger red wine with lots of tannin is the best fit and the most common recommendation is a classic, big Cabernet Sauvignon. You know what? I just don’t buy it. Let’s look at the types of meat that Cabernet best compliments. Strong flavor…nope. Filet Mignon isn’t a strongly flavored piece of beef. It’s quite mild for beef actually. Ok, well how about the fat content…Cabernet Sauvignon does great with fattier types of meat because the tannin from the wine clears the fat from your palate. 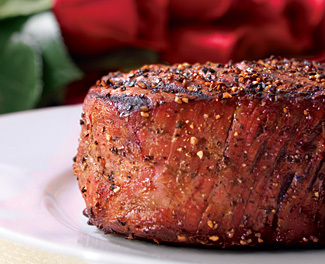 Uh…hmm…Filet Mignon is one of the least fatty pieces of meat. The tenderness in Filet Mignon doesn’t come from it being well marbled with fat like a rib eye or tri-tip. Tenderness in Filet Mignon comes from part of the tenderloin that doesn’t do a damned thing for the cow. It pretty much just “goes along for the ride” – kind of like your coworker that never seems to do anything but somehow manages to get a lot of the credit for a job others do. The muscle doesn’t get much exercise and therefore is not very tough. Little to any of the tenderness comes from fat. That lack of fat in the Filet Mignon doesn’t demand a big, tannic wine and in fact, I strongly believe the subtle flavor of the Filet Mignon is a far better pairing for subtly flavored red wines. If you are looking for a subtly flavored red wine to pair with Filet Mignon, the king is Pinot Noir at least on the West Coast of the US. A well made Pinot will have subtle aromas and subtle flavors. It won’t pummel your palate, overwhelming any subtle flavors the way a big Cab might. An Dolcetto or a lighter Sangiovese would be good alternatives if you want to venture outside of the norm a little. Winery-Sage is an online Winery Encyclopedia designed to help you compare wines, wineries, and regions by using a unique database. Cross-reference varietals and the wineries that produce them, as well as discover events sponsored by wineries and associations. We’re not here to sell you anything or pass you off to paid advertisers, just share the love for wine.